The Glower Chronicles #2 is here! I’m excited to share with you the cover and book description for Caught in the Rush, the second book in The Glower Chronicles and Fiona’s turn to tell her story! Fiona Wilde has always lived up to her last name, but a night in the emergency room was more than she bargained for. Now six months clean and sober, she’s thrown herself back into the only job she feels qualified for–guarding the emerging stars of L.A. from the demonic Glowers–while getting the rush she craves from casual encounters, always leaving before anyone can leave her. When her teen TV star client’s hot older brother Will arrives home for spring break, she sees the perfect opportunity for a fling with a built-in end date. Then the Glowers launch an unexpected attack, leaving Fiona scrambling to keep her client safe even as Will steals past the walls around her heart. With the demons closing in and the starlet rebelling, the stability Fiona has clung to is slipping away. Her growing connection with Will might be the thing that saves her–or the thing that tears her apart. 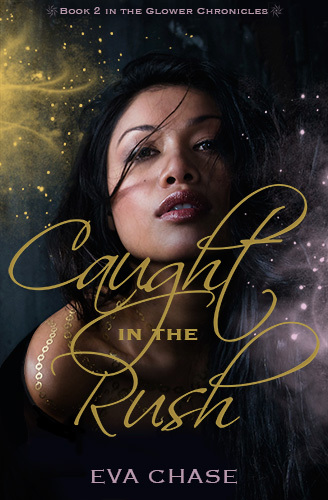 Caught in the Rush will be published on January 5, 2016. If you want to make sure you get your hands on it as soon as it’s available, you can pre-order the ebook on Amazon now.